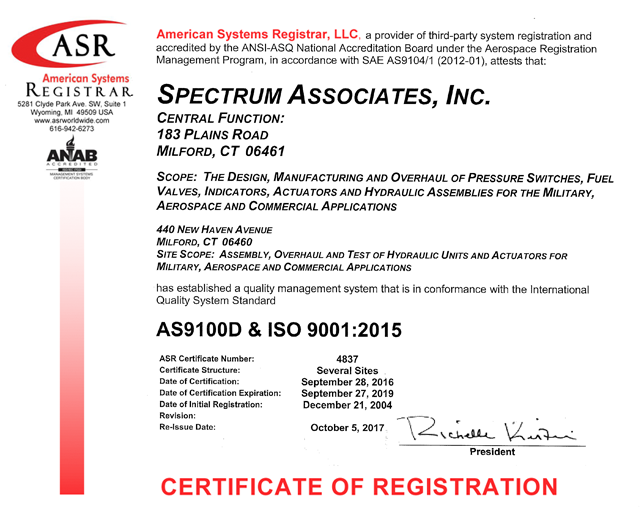 Spectrum is extremely pleased to announce that we have recently been awarded certification of our quality management system to SAE AS 9100 Rev. D and ISO9001:2015 by American Systems Registrar (ASR). As an indication of the importance we place on best practices, Spectrum successfully completed this rigorous transition a full 11 months ahead of the required date. Revision D of AS9100 and ISO9001:2015 are highly focused upon overall business practices including advanced planning, risk reduction, product safety and individual contributions to quality. As a quality –oriented aerospace supplier, Spectrum has instituted processes which deliver precision components on schedule that operate per specifications, every time.